It was one of those days to be honest, and it began the minute I caught wind of Arsenal's XI against champions Manchester City. "No, no, no! ", heck, I even scared the cat and likely annoyed the neighbors. While I am critical (in informed and intelligent ways), I will never slag off Arsene Wenger to the point of hatred, but it must be said, that our formation and tactical deployment on the day cost us the maximum point haul in our lunch time special at the Emirates. To be honest, it's been our issue in every match this season in the domestic campaign thus far, fielding the same formation in all four Premier League fixtures. It's been questionable at best, and it's seen us struggle to get the right results; it does not help that many players are not being utilized to the best of their ability. I am not sure where I should begin, but let's just go from top to bottom shall we? The purchasing of Danny Welbeck on deadline day was met with bi-partisan reactions; either you loved it, or you hated it. At first I was incredibly skeptical, but the more I considered the tactical implications, the more I realized that his acquisition made perfect sense...for a side that wants to play quick and incisive counter-attacking football. The problem here, is that Arsenal have not used that system since roughly 2008, with Wenger's preference being build-up play and keeping possession - there in lies the problem with the 4-1-4-1. If you look at the line up in the link above (don't we all love visuals? ), you'll notice that Welbeck was incredibly isolated. Unlike in a 4-2-3-1 or a 4-3-3 where the striker can receive the ball and have two or three options, the system we have used thus far this season is made to send the striker forward with a through ball or a ball over the top, not long spells of possession in the final third. Despite Welbeck getting an excellent chance to put us up early when his chipped effort struck the post, the England international was largely isolated all match long, having to do his best impression of Olivier Giroud and look to come deeper if he was to see the ball. When you have a player of Welbeck's pace and power, it's never a positive thing to see when he cannot use those attributes to stretch the oppositions back line. As for the flat-four midfield itself, the middle three of Aaron Ramsey, Jack Wilshere (who was arguably the man of the match) and Mathieu Flamini were effective in some areas, but lacking in others. Before City scored through Sergio Aguero, the aforementioned central trio did a wonderful job of always pressing for the ball to win back possession - it was beautiful to watch. But once City found the back of the net through tee diminutive Argentine hit man, our achilles heel of having a worrying lack of steel, grit and physicality in midfield reared it's ugly head yet again. For all of the work that Wilshere, Ramsey and Flamini put in, the physical side of the game brought forth by City central pairing James Milner and Fernandinho caused us problems as per usual. We did do well to adjust, but it required Alexis Sanchez to channel his inner Energizer Bunny to aid his team mates in central areas much of the time to great effect. 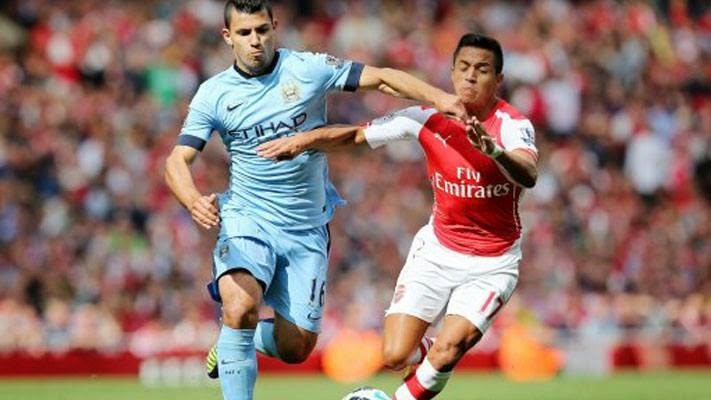 Whether it was helping to win the ball or surging forward to create chances, Sanchez was key to drawing defenders away from Ramsey and Wilshere for them to find their footing in the second half - Wilshere would respond with a brilliant equalizer, after Sanchez had won the ball back in City's half. Between Jack and Alexis, we had two all-action performances that should have earned us three points, but in the end it would be three draws on the bounce. If it is one thing that drives me absolutely insane, it is when a player of immeasurable talent is put in a position where he is rendered ineffective to the point that he becomes useless - in this case, it's Mesut Ozil. Arguably one of the best true number 10's in the world, Ozil has featured as a left midfielder in one too many matches this season. His comfort zone is in the middle, behind the striker, and able to receive the ball and pull the strings in the final third. Isolated on the left, lacking pace and a winger’s work ethic, Ozil can do little there to win over his many critics. More over, given his lack of work ethic, lack of pace and unfamiliar knowledge of responsibilities of the position, this left the defensively irresponsible Nacho Monreal at the mercy of the pace and direct style of Jesus Navas, who skinned him more than a few times over the course of the match, including finding too much space behind the Spanish left-back which lead to the first goal. This was a match for Alex Oxlade-Chamberlain (who seemingly just cannot get a game these days), where his power, pace and willingness to track back and held on defense would have been a welcomed site. As for Mathieu Flamini being preferred at defensive midfield on the day rather than captain Mikel Arteta, all it did was prove that neither of them are the answer for what is our biggest weakness. With plenty of rumors circulating that we had a chance to sign Sporting Lisbon and Portugal international holding midfielder William Carvalho, we're all left with the unfortunate situation of having to hold our breath and hope that we are not found out in midfield all season long. While Flamini and Arteta work hard, neither of them are good enough in possession, intelligent enough on the ball or physical enough to impose their will on the midfield battle that often defines Premier League matches. This has been our weakness since Gilberto Silva left the club, and unless it's sorted in the January transfer window, it could cost us a real chance at the title yet again. In the case of yesterday's performance, the presence of a capable holding midfielder is to guard against teams that intent to hit you on the counter - the evidence put forth by Flamini suggests that he is not capable of performing in such a role, and by evidence in past matches, neither is Arteta. Finally, in regards to BFG, he's really become quite a liability. When your side play a possession based tactical system, it lends to you having to deploy your back line further up the pitch so that you can squeeze the opposition in their on half of the park. While this works, everyone knows that Mertesacker is slower than molasses in winter, and thus, routinely targeted. When you have Monreal on his left (who is no speed demon either), you're in trouble against a side like City who have bags of pace in key areas. Something has to give, and if Wenger is insistent on keeping the high line at the back, then it has to be realized that Mertesacker's place must be taken over by young Calum Chambers - for further evidence of this, you only have to look back to Germany's run in the WC this summer, when manager Joachim Low axed the towering Teutonic defender from his XI, for the same reasons that we should consider doing the same. In Chambers, you have a gifted young defender, who is excellent in the tackle, has good positional awareness, a physical side to his game, but most of all, he has far more pace than his German teammate. While we all love him, surely what's best for the club will come first. 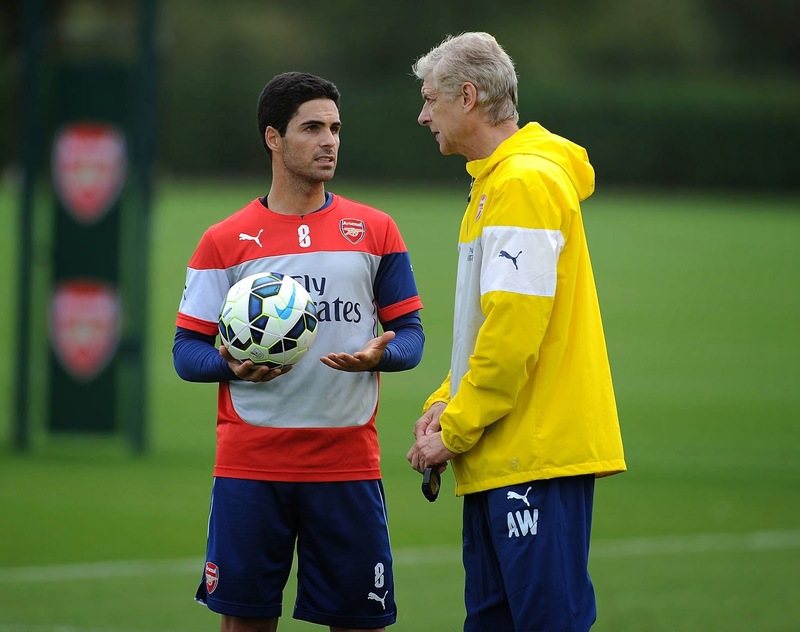 Where do Arsenal go from here tactically? One certainly does have to wonder if Wenger intends on keeping the 4-1-4-1 or, when everyone is fit, if he will revert back to the far more effective 4-2-3-1. While I cannot read minds, what I can say with some experience behind it, is that the latter of those two options not only fit out tactical system (build-up play and possession), but they suit our players as well. While it is no secret that we have a ton of attacking options at the club these days, the key to our success must remain how to best utilize them. With the return of Theo Walcott to full fitness, Arsenal are blessed with no less than five players who have afterburners for legs; this must be the key to our tactical success. With Welbeck now leading the line, Sanchez and Walcott could take up residence on both flanks and on either side of Ozil, who would then be in his preferred position and surrounded by players who all want to get forward and get into the box with pace. Behind Ozil, you have two box-to-box midfielders in Ramsey and Wilshere, but if you did need a player who is going to sit deeper behind the attack, then you could opt to bring in Flamini or Arteta if necessary. And as for the defense, with Mathieu Debuchy now out for two months, rather than using Chambers at right-back to replace him, give a run of matches to Hector Bellerin to replace the French international so that Chambers can slot in for Mertesacker as discussed earlier. Many may be frustrated that we are 1-3-0 after our first four league fixtures - I am certainly one of those people, but there is not a cause for concern just yet. While we were poor against Everton and Leicester, we should have beaten City. We are not yet blessed with a fully fit squad and we still have players adjusting to life at a new club and what is expected of him; truthfully, there is still cause to feel positive. It certainly is not the start any of us wanted, but while this may sound cliche, it could always have been worse. Having been thrashed by our rivals last season, a win against City in the Community Shield and a 2-2 draw early in the season are reasons to be positive. With tactical questions that still need answering, just remember that it's still early days - at least we aren't Tottenham!